Have made 2 choke baluns 1:1 for some dipole. The big toroid core is for a delta loop For 60 mtr band. Have made a 1:2 balun for the delta loop. Have made 1 qso on 60 mtr ,OJ9X, a qrp qso. 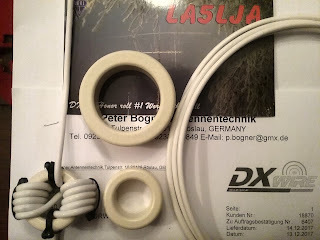 Buy the parts for the baluns from DX-wire in Germany. Quick delivery, ok prices and fast respons on e-mail.